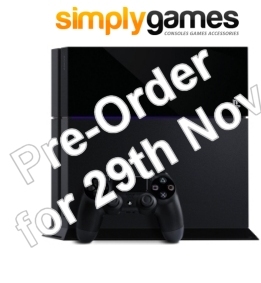 If you want the new PS4 console for the launch on 29th November you will be wise to pre-order very soon. The vast majority of UK retailers can no longer guarantee delivery for the release date. The magic cut-off date set by Sony seems to be 6th August. Nearly all retailers are quoting that orders after this date cannot be guaranteed to be received for launch (although they are still taking pre-orders). That's not to say you won't receive it then, just that it will be a lottery as to whether Sony's production line has been running at full steam (or not). The UK online retailers in this boat include Amazon, Argos, Currys/PC World, Zavvi, GAME, Asda, Sainsburys, Tesco and the official Sony website. The current rare exception to the above is the online gaming retailer Simply Games. They are still offering the PS4 stand alone console (no bundle) for the recommended retail price of £349.99 and quoting "Item will arrive by the day of release!!" on their website. This is unlikely to last much longer. Other bundles with games are also available. Sony have confirmed that they will be holding back some stock for the launch day so that there will be a few units on the shop shelves, however it's likely to be a fight getting hold of one of these and unless you fancy camping overnight on the street outside the shop on a cold wet November night, get ordering! The stock outlook after launch isn't looking favourable. Sony will obviously be happy that their new console is selling like hot cakes, however we are sure many parents will be stressing trying to track down a PS4 before Christmas day. The Stock Informer website will be constantly tracking UK online retailers for PlayStation 4 console stock, ensuring you will be the first to know when availability is found. Update - 18/09/2013 9am - Simply Games are now offering bundles only. Although still with guaranteed release day delivery. 08/10/2013 10.45am - Simply Games have now sold out of all of their PlayStation 4 consoles for day one of release and have stopped taking pre-orders.